With a flurry of classes, work and activities, mealtime can come and go in a matter of minutes. How do students make sure they’re getting the nutrition they need to keep the day moving? Gabriela Alfonso, a registered dietician based at 8th Street Campus Kitchen, has answers. Alfonso’s office provides a number of free services to students, including nutritional consultations, grocery shopping tips and healthy cooking lessons. FIU News caught up with Alfonso and her graduate student intern, Carolina Schneider. They offered a few tips on eating balanced meals on and off campus. When you enter the dining hall, take a lap and see what’s available before grabbing the first thing you see. Alfonso said that when people are hungry, they tend to grab the first thing that looks good, which might not be the healthiest or most balanced meal. Look for the vegetable you want, the protein you’re in the mood for and the grain you’re craving, she said. Alfonso suggested planning when to eat in advance to avoid the “hangry” rush. Savannah MacDonald, a freshman living on campus, said it’s important to her to eat regularly throughout the day to avoid impulse food choices. 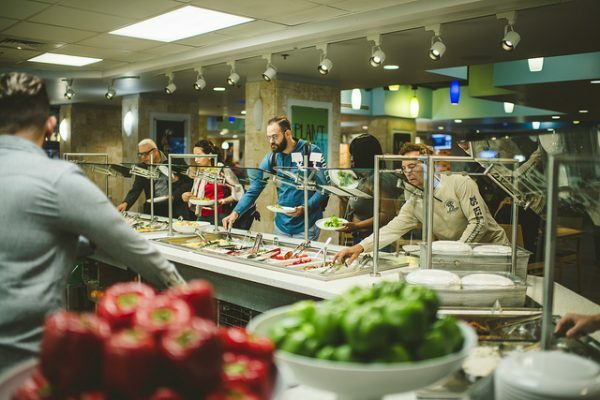 As Joshua Nolasco, a freshman living on campus, added chickpeas and Italian dressing to his salad at 8th Street, he said he it’s easy for him to eat healthy on campus with all of the locations he can use his meal plan. “There’s a lot of options at every restaurant you go to, so it’s not hard to keep it healthy,” he said. 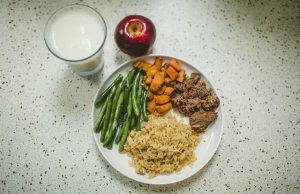 One of the best and easiest ways to put together a balanced meal is to use the USDA’s MyPlate recommendations, Alfonso said. It shows the amount of protein, grain, fruit and vegetables, and dairy a person should portion out on their plate. “It’s a great way for someone who doesn’t have any nutrition knowledge or food knowledge and is trying to be more conscious about what they’re eating to learn about the food groups and balance their meals,” Schneider said. MacDonald said she tries to take care in balancing her meals. For breakfast, she adds some fruit alongside her omelette, and for lunch she adds extra vegetables to a rice bowl from the stir-fry grill at 8th Street. “I try to choose the healthiest foods and make sure I’m getting enough of everything,” MacDonald said. MyPlate can also be used for snacks. If someone wants a banana for a snack, he or she can add some peanut butter for protein and oatmeal on the side for grain. 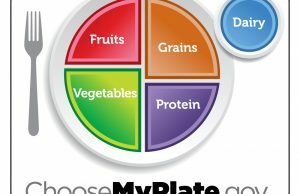 MyPlate works regardless of plate size, MacDonald added. Servings of fruits and vegetables don’t always need to come with a meal. To keep quick bites balanced and nutritious, Alfonso suggests carrying healthy snacks to eat throughout the day to compensate for the missed servings. Luis Chacon, a junior commuting from home, was eating his lunch of rice and meat outside of the Graham Center. He said he always brings his lunch from home as he rushes from class to work. Keeping it balanced for him means removing some of the starches and adding in more vegetables. “It’s not hard to take out some of the rice or pasta and add more vegetables, to balance the food more so you have more energy throughout the day,” Chacon said. Daniela Casemertino, a junior commuting from home, was spotted hustling to her next destination with her lunchbox and water bottle in hand. She said she always brings her own food and rarely buys on campus. She most often takes dinner leftovers from home that can be eaten cold for lunch at school, such as sandwiches, salads and chicken. In between mealtimes, she carries nuts to keep her energized throughout the day. Casemertino says bringing her own food from home helps her keep track of calories, carbs and other nutritional values. Hailie Avila, a freshman commuting from home and a vegan, said she looks for the fewest number of ingredients when she picks up snacks. To learn more, look for nutritionist Alfonso around campus offering more healthy tips and treats! Visit the Wellness & Sustainability tab at dineoncampus.com/FIU for more information.